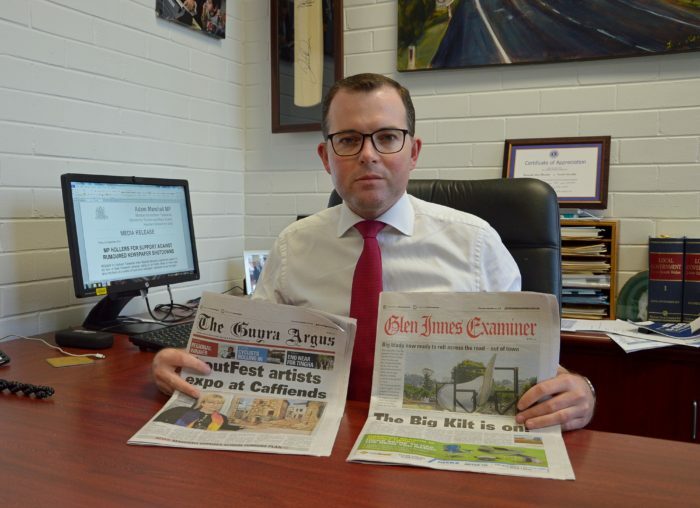 Northern Tablelands MP Adam Marshall with recent copies of the Glen Innes Examiner and Guyra Argus – two local newspapers Mr Marshall is worried could be shut down by Fairfax Media. MEMBER for Northern Tablelands Adam Marshall delivered a passionate speech on the floor of State Parliament yesterday calling on for Fairfax Media to come clean about the future of a number of much-loved newspaper mastheads across the region. On the back of deep cuts and staff reductions which saw nearly 30 journalists, staff and photographers given the chop a few years ago, Mr Marshall hit out in his speech against any possible moves to wipe out some of the smaller newspapers, making a direct plea to Fairfax Media management. Strong rumours signal the imminent loss of the Guyra Argus and possibly the Glen Innes Examiner, with further reductions planned for the remaining stable of publications in the Northern Tablelands – the Armidale Express, the Inverell Times and the Moree Champion. The Tenterfield Star, the Walcha News and the Namoi Valley Independent could also be on borrowed time. “Unfortunately, I have heard some disturbing rumours about Fairfax and that is that some of these well-known and beloved mastheads will be closing down,” Mr Marshall said. “With Channel 9 on a course to takeover, it is of great concern that it has been publicly stated that journalism and newspapers is not really a priority in the new company. “I have heard that the Guyra Argus will be completely shut down and retired, and that the Glen Innes Examiner will be closed after proudly serving the Glen Innes and Highlands communities for more than 100 years. “This cannot be allowed to happen. It would be an absolute travesty and a kick in the guts to those communities, which need and deserve their local publications. The MP has written directly to the CEO and Managing Director of Fairfax media, Greg Hywood, seeking immediate clarification to calling on him to take a lead role in throwing his full support behind keeping our media local. “I call on Fairfax Media to come out and publicly announce what the future holds for the mastheads across the Northern Tablelands electorate and while I am at it, Fairfax should also come clean about the future for the Walcha News, the Northern Daily Leader in Tamworth and my old paper the Namoi Valley Independent at Gunnedah,” he said. “Newspapers are important in a climate where we are seeing the contraction of local media and the centralisation of all media. “People get very few opportunities, whether it is in radio, television or print, to see local news about their local community. “Increasingly, people are being fed stuff that comes from Sydney and other parts of the State. We want to see our local news in our local newspapers.